Backstage at his band's sold-out Barclay Center show, Brendon Urie goes from Panic! 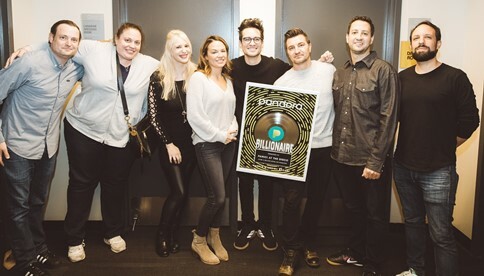 At the Disco to mild awkwardness in a lobby as he joins a bevy of music-industry professionals for a plaque presentation. Suddenly, the elevator doors opened, signaling the start of the intramural battle of the bands. Seen wondering how to find the Panic room are: (l-r) Atlantic's Chris Brown, Crush's Gaby Fainsilber, Atlantic's Suzy Yoder,Pandora's Rachael Spangler, Urie, Pandora's Jeff Z, Crush's Dan Kruchkow and Scott Nagelberg.